BSN Edge HyperShred is an advanced complex of tested substances intensively supporting reduction of adipose tissue. 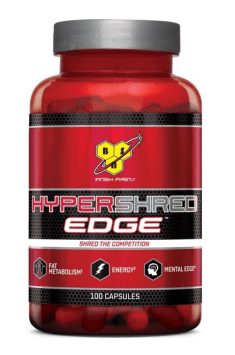 HyperShred Edge provides additional dose of energy during training and increases concentration during exercises. BSN HyperShred Edge contains substances which make the body system burn adipose tissue. The supplement supports the fight against adipose tissue in many directions, i.a. enhances lipolysis, increases thermogenesis and prevents adipogenesis (the process of fat cells formation). Lipolysis – what is it? Lipolysis is a process that takes place during the intensified physical effort, at low temperature of the environment, during stress or hunger, when there is a lack of substrates for energy production. Lipolysis is a process of transforming triglycerides (located in the cells of adipose tissue, adipocytes) into glycerol and fatty acids which, after being captured from the bloodstream, are converted into energy. For releasing fatty acids from adipocytes, the body system needs glucose, whose level can be very low during lipolysis. Thermogenesis – what is it? Thermogenesis is a natural physiological process of heat production which takes place in the human body system. In order for heat to be produced and to maintain the proper body temperature, energy obtained from burning calories is necessary. L-tyrosine – an endogenous amino acid which is a basic building material for proteins. Tyrosine plays a very important role in the body system, because it is used for the production of substances necessary for the functioning of the organism. This amino acid takes an active part in the formation of neurotransmitters, such as noradrenaline, adrenaline and dopamine, which are responsible i.a. for the processes of muscle contractility or production of key hormones inducing adipose tissue burning. Adrenaline and noradrenaline are responsible for the process of lipolysis. However, about 30 minutes of training is needed for them to reach an appropriate level and be able to act. Therefore, it is worth to increase the level of tyrosine, which will raise the levels of these hormones. It is also worth noting than the increased amount of neurotransmitter accelerates signal transmission between sensory receptor and motor receptor, which allows for better training results. Acetylcarnitine (N-acetyl-L-carnitine HCL) is a vitamin-like substance responsible for the proper functioning of the nervous system and muscles. Acetylcarnitine provides the body with L-carnitine, a substance that stimulates burning of adipose tissue in two ways; it accelerates the process of fatty acid transport, which results in their faster burning and also activates the enzymes responsible for burning fatty acids derived from adipocytes during respiratory chain. Caffeine is a substance of plant origin. It shows stimulating properties as it stimulates the central nervous system, widens blood vessels and promotes heart functions. This results from blocking adenosine receptors, which leads to increased secretion of catecholamines (adrenaline, dopamine and serotonin). Caffeine increases also the secretion of glucagon, a hormone responsible for inducing lipolysis, which is desired by people who want to burn excessive adipose tissue. Green tea extract – a natural substance containing polyphenols, mainly catechins. These compounds induce thermogenic effect and inhibit absorption of lipids, so that they counteract fat deposition. Green tea reduces the glucose level in bloodstream, which prevents diabetes. Cayenne pepper is a spicy seasoning. It is produced from pepper which origins from a region in the Central Africa, Cayenne. Its spicy flavor results from the presence of capsaicin. Capsaicin inhibits deposition of adipose tissue. Moreover, it stimulates the body system to increased thermogenesis by activating the TRPV1 receptor. Furthermore, it increases production of adrenaline and noradrenaline in the adrenal glands, which in turn induce lipolysis, a process of fatty acid transformation into energy. Quercetin is a flavonoid that can be found in plant products. Technically, it is treated as a dye, which is why its largest quantities can be found in plants of intense color. Quercetin and other flavonoids support regulation of adipose tissue weight by inhibiting the adipogenesis process (creation of adipocytes) and also by enhancing lipolysis. Citicoline (cytidine 5-diphosphate-choline) is an endogenous nucleotide which naturally occurs in the body system. It is a cofactor for the production of phosphatidylcholine and enables the synthesis of phospholipids of cell membrane. Supplementation with citicoline increases the level of acetylcholine, one of the main neurotransmitters in our body. Acetylcholine improves brain functions, promotes concentration during training and reduces fatigue. BSN HyperShred Edge contains also B-vitamins which complement deficiencies. Among others, B-vitamins improve functioning of the nervous system, prevent accumulation of toxins, improve the synthesis of hormones, participate in blood cells formation and regulate secretion of gastric acid. To sum it all up, BSN HyperShred Edge is a complex supplement that will help you to burn excessive fat. It is recommended for all athletes who want to reduce their weight. HyperShred Edge affects the body system in different ways, so that you can be sure that supplementation will bring desired effects. 1 capsule for breakfast, 1 capsule for 30 minutes before training. 1 capsule for breakfast, 1 capsule 6 hours later with a meal. After a week of supplementation, the dose can be increased to 2 capsules 2 times a day. The dose of caffeine contained in the supplement covers the maximum, safe consumption limit, therefore, you should treat the supplement as the only source of this substance during supplementation. You should not use the supplement late in the evening due to the high doses of stimulating substances that can cause sleeping problems. HyperShred Edge contains vitamin B12 in form of cyanocobalamin. This is an unmethylated form of the vitamin, which can be harmful for people with methylation disorders (people with MTHFR gene mutation). In such case, it is rather recommended to use supplements containing methylcobalamin. Gelatin capsules (pigment: titanium dioxide, iron oxides, carmoisine), anti-caking agents (silicon dioxide, magnesium salts of fatty acids), filler (microcrystalline cellulose). CDP-choline (Citicoline), otherwise known as cytidine 5’-diphosphocholine, is a compound with nootropic properties discovered in 1950s which crosses very easily the blood-brain barrier. After getting into the body, CDP-choline is broken down into choline and cytidine with a positive impact on the function of the nervous system. Cytidine is converted in turn into uridine – a component of nucleic acids which helps maintain normal mental performance. Choline is in turn a very important substrate for acetylcholine production and thus increases focus and mental clarity. Despite of its great efficacy in penetrating the blood-brain barrier, CDP-choline boosts choline levels in the brain less effectively than alpha-GPC. This is due to the fact that a citicoline molecule provides smaller amounts of choline (about 18.5%). In comparison with choline bitartrate, CDP-choline has much higher bioavailability (even more than 95%). Citicoline also prevails over it due to the content of cytidine which is a precursor to uridine.